Why Bring ‘Play’ into Your Educational Facility? The benefits of play in child development are limitless. This popular field of study has produced thousands of articles on the subject of play and children. They all came to a common conclusion: play is essential for children. Play teaches social skills, such as how to interact with others; physical skills, where children’s motor skills are developed and fine-tuned; and cognitive skills through metacognition, wherein children learn how to learn and think critically and creatively. Equipped with this vast sea of data, it is impossible to ignore the necessity of play. Let Us Bring the Field Trip to You! Rent-A-Theme Entertainment delivers to you theme kits that were designed with play in mind. Play, at its best is a fully immersive, sensory experience. Our theme kits incorporate this crucial element. All of our theme kits are engaging, interactive, and skill-based. 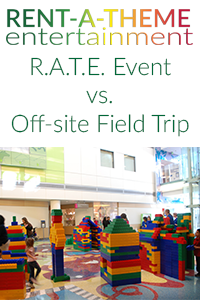 Rent-A-theme Entertainment brings a fun-filled experience to your location thus eliminating many safety concerns encountered going out on a field trip. Renting is the economical solution for bringing activities to your children by saving you the expense of purchasing costly equipment that requires technical maintenance and storage. So contact us, and book your theme kit today! Non-profit or Child Care Center? Rent-A-Theme Entertainment pricing includes discounts for schools, child care centers, and other non-profits. Call for more information!